The students have planned a social after our weekly Thursday night Mass tonight. They’ve requested people bring cats. 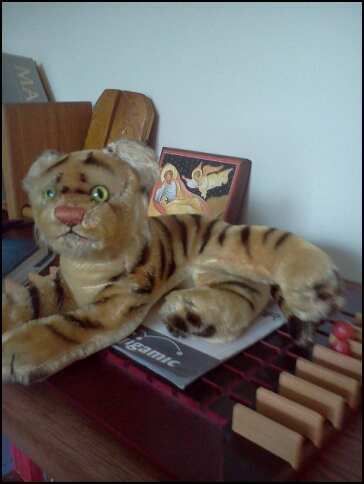 My cats don’t like to travel, so I brought a stuffed tiger from my very early childhood. Here he is posing with my “Joseph’s Dream” icon in the background. What do you think? Over the top to have two readings about not lording it over others and leading by service? How many priests will “forget” we have no pope and continue to mention “Benedict our pope” in the Eucharistic Prayer? This entry was posted in Liturgy, Parish Life, Scripture and tagged cats, Pope Benedict, Scripture. Bookmark the permalink. We may be religious or not, we may agree or disagree with Pope Benedict’s views, but I believe we must admire a decision that places the best interest of the Catholic Church above his personal prestige. I’m sure some priests will ‘forget’. Some will forget. I printed out the ‘sede vacante’ commemoration for the various forms of the Eucharistic prayer in a form that they could be easily cut apart and slipped into the Missal, and handed the sheet to my pastor. A well-trimmed sticky note to cover the line in the EP is my method. Works every time.